Visiting a beautiful lake or pond surrounded by mixed woodlands or sprawling prairie is one of the most serene and relaxing things I can think of doing on any given day. Nothing beats hearing the hum and buzz of surrounding wildlife, feeling the gentle breeze on my face, and looking down upon the refreshing clear water. Wait, what? Pool-clear lake water? That’s not right. Healthy lakes and ponds typically have a slight greenish/brown hue to them, an indication they contain an ample amount of phytoplankton, the base of the food chain. Being too clear is often a sign that something is afoot in that aquatic ecosystem. In the DuPage forest preserves, Deep Quarry and Bass Lake at West Branch Forest Preserve, Mallard Lake at Mallard Lake Forest Preserve, and Eagle Lake at Hidden Lake Forest Preserve have this crystal-clear “swimming pool” water thanks to zebra mussels. 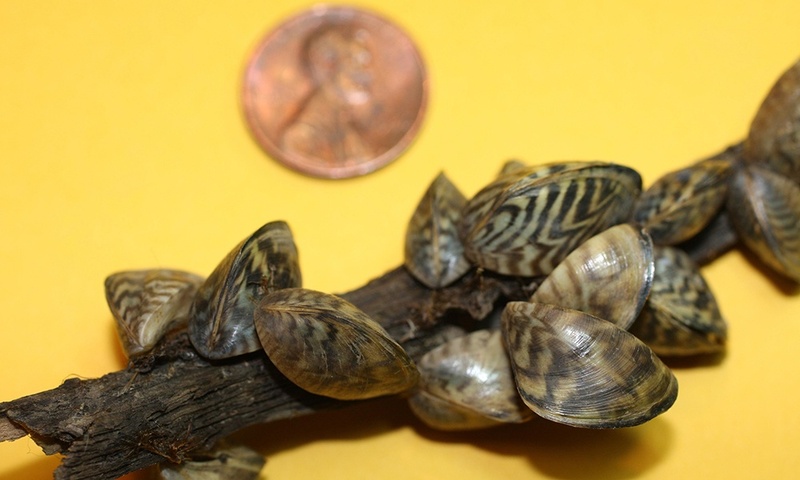 Zebra mussels are an invasive species in the United States believed to have come over on ship ballasts from the Caspian and Black seas during the late 1980s. Since their arrival, presumably through the St. Lawrence seaway, and eventual discovery in Lake St. Clair, they have spread as far south as the Gulf of Mexico and as far north as southern Canada. They have also made the trek across country to California. So why do we care? Well, these filter feeders siphon the good phytoplankton (the main food source that other small organisms rely on) out of the system and essentially “kneecap” the entire food web. One zebra mussel can filter up to one liter of water per day, so hundreds and thousands of zebra mussels can turn over an entire body of water in days or weeks. 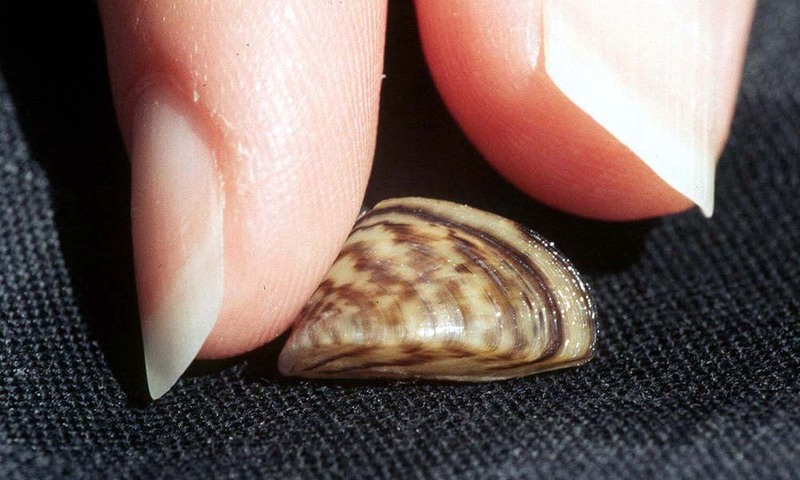 Unlike beneficial native freshwater mussels, zebra mussels are so prolific they remove all viable food sources from the water and attach to hard structures, including freshwater mussels. This can forcibly close and starve out good mussels by preventing them from feeding. 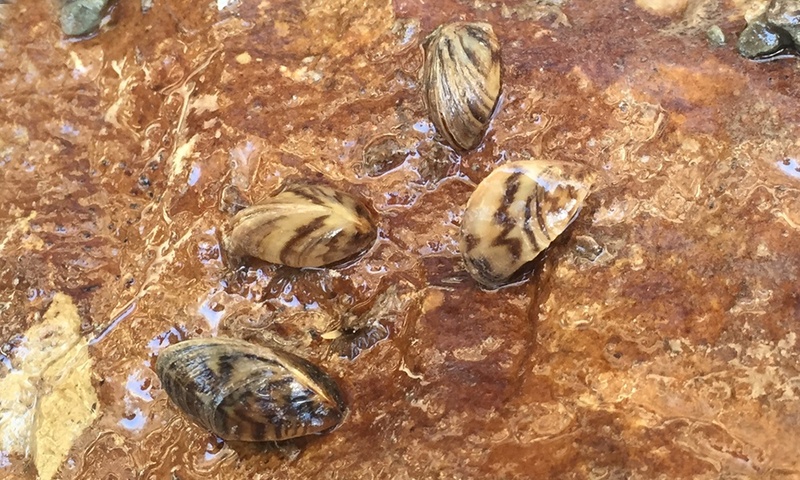 Since zebra mussels were first discovered in DuPage forest preserve lakes in 2010, we’ve speculated on how and where these organisms came from. Maybe anglers and boaters accidentally transferred them via bait buckets or disposal, or larger aquatic or semi-aquatic fauna (waterfowl and aquatic mammals) brought them in from other locations. There is no good or clear way to ascertain exactly how they arrived, but for the first time in DuPage, we have a better way to determine where they came from. Earlier this year, I began working with Rodney Scott, an associate professor of genetics at Wheaton College, on a project to sequence genes from zebra mussel mitochondrial DNA. Preliminary findings suggest the zebra mussel populations in three of the four DuPage forest preserve lakes share the exact same DNA fingerprint for the analyzed gene, unlike zebra mussels in the fourth DuPage forest preserve lake. Searching an online genetics database showed that zebra mussels with both DNA fingerprints have occupied Lake Superior in the recent past. However, the three lakes exhibiting the exact match also contain genetic material from Nippersink Lake in the Fox Chain O’ Lakes. So it appears that three of the four lakes were colonized by zebra mussels from the same source, or were moved among lakes after one was colonized, while the other lake was infested through a different source. We’re currently investigating other genetic markers to see if we can further clarify the sequence of events for the invasions of these four lakes. Research and management of this invader is challenging, but also exciting and rewarding when the picture becomes clear, unlike our goal for the water itself, which we like a little muddied. Dan Grigas is an ecologist in the Natural Resources department at the District. He has a B.S. in natural resource management from Northland College and an M.S. in aquaculture and fisheries from the University of Arkansas at Pine Bluff. As the District’s fisheries ecologist, he works to provide sustainable game and non-game fisheries within District water bodies for the conservation of these species and recreational opportunities for the public. At home, he enjoys spending time with his wife and three kids, taking family fishing trips, and teaching his children about all things outdoors.